I’ve become quite a fan of sweet potatoes in the last year or so but my use of them hasn’t tended to the adventurous. Most often I’ll use a sweet potato to make wedges as an accompaniment to a cheese topped baked mushroom; the sweetness of the sweet potato providing a delicious contrast to the goats’ cheese I typically top my mushroom with. Simpler still, I’ll occasionally bake a sweet potato and serve it with salad and grated cheese. Basically, I use sweet potatoes as a replacement for the humble spud when I want to make an easy meal slightly more indulgent. After a brief flirtation with Spring, the weather has turned grey, blustery and slightly chill again; I felt the need to cook something colourful, warm and exotic to combat the great greyness. Turning to Madhur Jaffrey’s World Vegetarian for inspiration I was drawn to a recipe for Sweet potatoes with sultanas and cinnamon. Once I’d chopped the sweet potatoes, which seemed particularly hard, this was ever so easy to cook, not a dish to turn your back on but not one which requires the cook to be juggling multiple tasks at once. In a possible deviation from the recipe I opted for red onion instead of white, I tend to assume white is called for if it’s not specified, the richness of colour from the onion and the sweet potato was a feast for the eye. The combination of ginger and cinnamon made this both exotic and comforting and I would happily have eaten double portions. It’s suggested to serve this with dark greens and cavolo nero would be perfect with it but this time round I served it with buttered spelt bread and a handful of almonds, I’d happily eat it with the same accompaniments again. This is getting 5 out of 5 for ease of cooking and for taste! Let’s be completely honest, The Railway Modeller and I both like cake; we probably like cake more than we should really. I thought the next celebration cake was due for an April birthday, then I discovered that Simnel Cakes were traditionally baked for Laetare Sunday (probably better known as Mother’s Day in the UK); obviously I decided to bake one. I found a recipe in one of my books and a bit of research suggested two weeks would be adequate maturing time, so this week I’ve made a cake. I’ll write more about it when we’ve actually tried it. 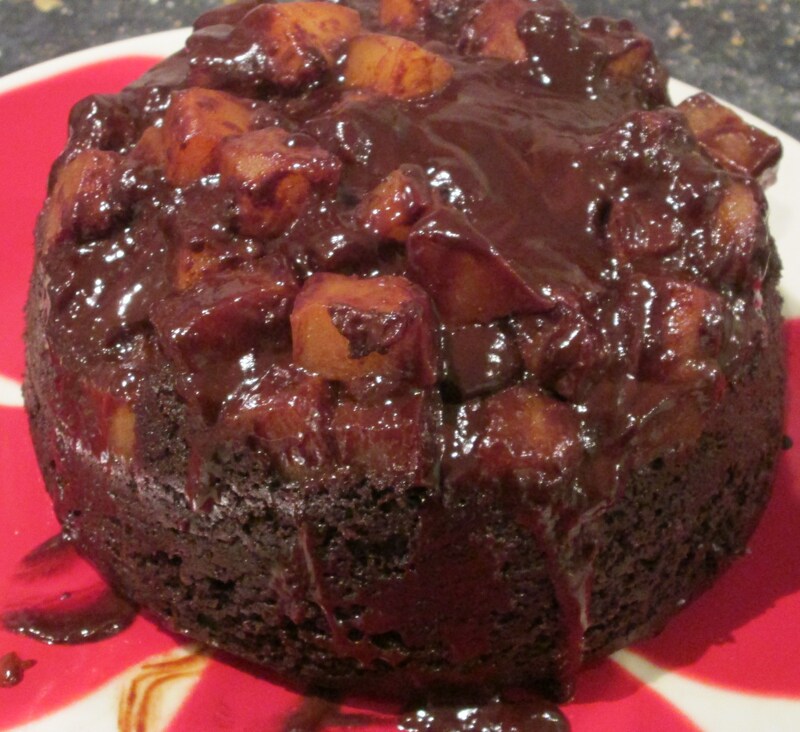 In the absence of more to say about cake I’m writing about a pudding instead! Earlier this week I was given a bag of very ripe, slightly bruised pears. This classes as a treat because pears usually seem to be sold under-ripe and even the smell of good ripe ones is cheering. Obviously the bruising meant there would be some wastage so I needed to use them in something I would be chopping them for; my usual dish for pears like this would be a crumble but I thought my hands would probably object to tickling the crumble topping into being at the moment so decided to come up with a sponge pudding instead. This was a good decision to make, my crumble is probably healthier but this was pure comfort food. It’s a slightly imprecise recipe in places and while my scales mean I weigh ingredients in ounces the chocolate content is given in grams because I used half of a 100g bar, it made sense when I was throwing things together in the kitchen. Grease a 1¾ or 2 pint pudding bowl. In a saucepan, melt the knob of butter over a low heat. Break the chocolate into chunks and add the chocolate and golden syrup to the pan with the butter. Stir continually until everything is melted and evenly mixed. Pour this chocolate sauce into the pudding bowl. Peel and chop the pears into roughly 1cm cubes, discarding the cores, and drop into the pudding bowl on top of the sauce. Mix the remaining ingredients, except the cream or milk, in a food processor. Add the milk or cream a little at a time until the mix looks smooth and spongy but not runny. Spoon the sponge mix on top of the pears in the pudding bowl. Take a sheet of greaseproof paper and lay a sheet of kitchen foil on top of it, pleat the two together down the centre. Cover the pudding bowl with the greaseproof paper and foil (paper side to the pudding) and secure with string. Trim any excess paper and foil. Place the pudding bowl in a steamer and steam for around 1¾hours. Turn pudding out onto a plate and serve hot with cream or custard, alternatively serve cold as an indulgent cake. The first time we met you you claimed my husband as your own, sleeping contentedly on his lap and winning us both over. A few days later you came for a trial stay and it became obvious from the word go that you would be staying long term. 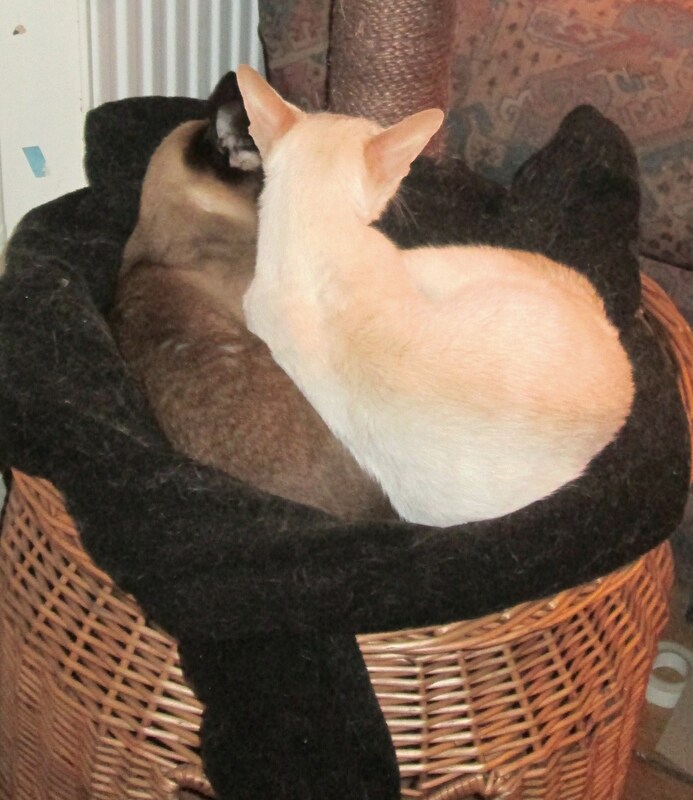 Within minutes you had bonded with our seal point and the two of you were curled up together washing one another, you were almost inseparable from that day on. 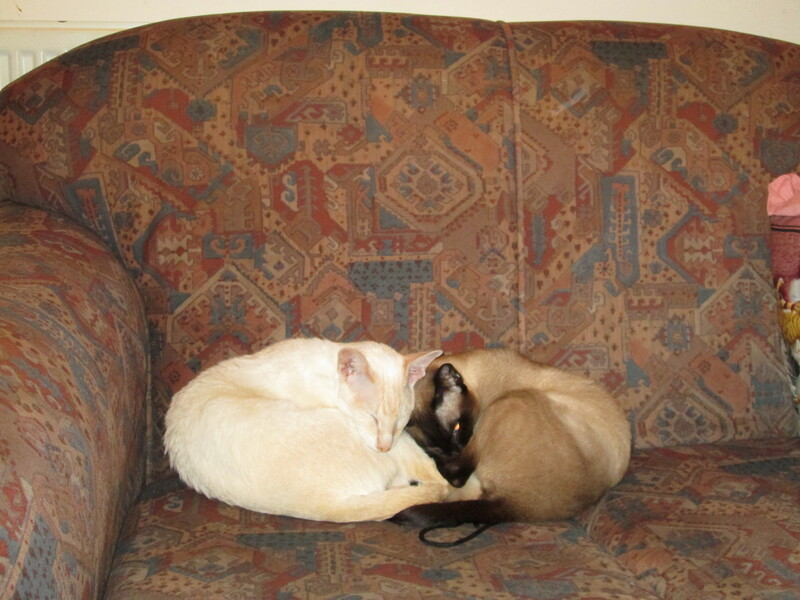 When a pair of very young moggy kittens arrived unexpectedly you happily made yourself foster Mum to the two of them. 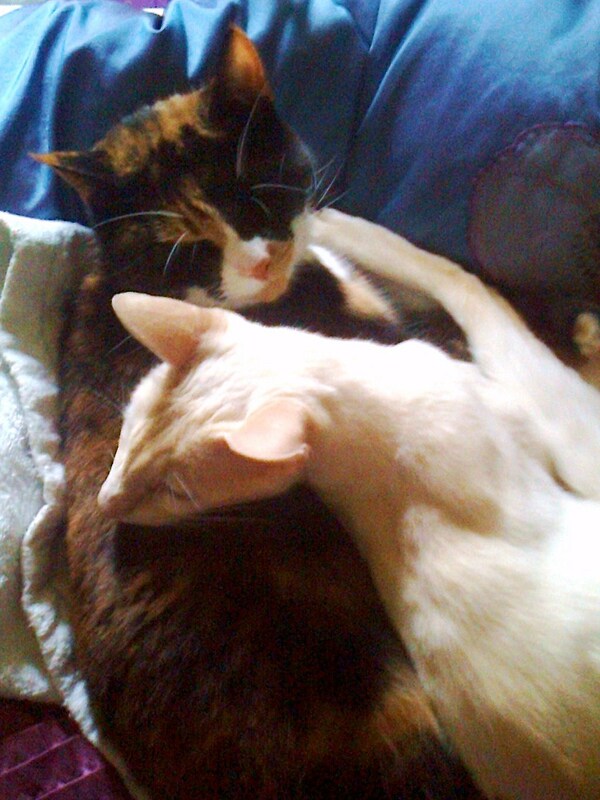 The one who stayed with us as an adult cat continued to be mothered by you on a regular basis. You taught us that it’s not just dogs who play fetch. Your favourite toy was a spider made from pipecleaners, and you were most demanding if we didn’t throw it for you as soon as you asked us to. You were also somewhat insistent about being fussed when you wanted it, pillows existed for stomping on not sleeping on if you wanted attention at bedtime. There was strong competition between you and our ginger girl to receive the most brushing, but you were the one who took to stealing the nail brush and rolling on it if we didn’t give you as much grooming as you wanted. You did start to slow down, and it was hard to admit it but we knew you were getting old. You were happy though, especially if there was somewhere warm to sleep. If the somewhere warm had another cat to curl up with you were even happier. Sleep well my little lioness. I’m conserving my energy at the moment, by next week I should have plenty but at the moment I’m at a low ebb; this pilaf, from Vegetarian Classics Simple Dishes for Every Occasion, looked like it would suit this weary cook nicely. With only one onion and a few mushrooms to slice, and minimising the washing up by being a complete meal cooked in only one pan, it doesn’t get much less strenuous to cook from scratch. Unusually, the aroma of the spices sautéing with the onion drew The Railway Modeller through to the kitchen to tell me how good it smelt. Uncertain as to whether The Railway Modeller would like bulgar, he doesn’t think he’d ever tried it, and knowing he doesn’t share my liking for lentils I was heating something else up for him but I promised him some of the pilaf to try as well. Once everything was simmering in the pan with the stock it could more or less be left to itself. With an almost finished knitting project on my needles, which I’m keen to wear before it warms up too much, and the next knitting and crochet projects crying out for me to start them I was quite happy to let the pan simmer away with little attention beyond an occasional stir. My dinner didn’t suffer for my neglect, it was ready in the expected time with both bulgar and lentils cooked to perfection. The recipe suggested that it would make four portions as a main dish, you could probably get five or six portions out of it if you were serving it with a good salad or planned a dessert. Personally I think I’d prefer this pilaf as a side dish, it would compliment a nice, fruity tagine very well. The Railway Modeller seemed to like the balance of spices in it and I don’t think he objected to the bulgar but I’d need to come up with a lentil free version for him to try it again. I admit it, I’m lazy about lunches. Typically I buy something at work to eat that day and the next, a tub of fresh soup and some nice bread or a packet of oatcakes and something to accompany them. This approach is lighter on my pocket than a daily trip to the sandwich shop would be but I always feel that if I could just get myself a little more organised I could spend less and have the satisfaction of something I’d made myself. It seemed to me that the challenge was to find lunch options that looked interesting enough to motivate me to try them, this week I came across one. In The Book of Vegetarian Cooking by Ted Smart I came across this pâtè recipe which sounded similar to the Baba Ganoush I sometimes buy to go with my oatcakes. Given that I’d buy Baba Ganoush more often if it was less expensive I decided this had to be tried. As often seems to be the case, something I’d assumed would be fiddly turned out to be incredibly easy, basically bake the aubergine and then peel it and purée with the rest of the ingredients. I was pleased before I even subjected it to the taste test as, for around the same price as the Baba Ganoush I usually buy, I had about three times the volume of pâté. Tasting it I was pretty happy too, eating my way through this is going to be no hardship at all. I actually like the consistency more than that of my usual bought option, mine is less wet. The flavour isn’t quite as nice as that of the Baba Ganoush, I’d like a little more lemon and less garam masala or possibly different spices; I’ll take a cheeky look at what I buy and then have a play with the recipe. I will make this again. There are certain dates over the course of a work year when I feel the need to ply my colleagues with cake. Monday was one of those days. I considered trying a new cake recipe but, wanting one cake to suit vegans and non-vegans alike, I decided to play it safe with one of my own creations which has become a reliable fall back over the years. Thoroughly mix all ingredients in a food processor. Lightly grease a 1lb loaf tin, pour the cake mix into the tin. Bake for around 45 minutes, until a skewer or smooth knife comes out clean after poking into the centre of the cake. Allow to cool in the tin for about 15 minutes, then turn out onto a wire rack to finish cooling.